The NMBVAA was established in Australia in June 1995. 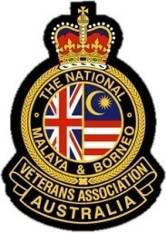 There are Branches and sub-Branches of this Association in most Australian States, and while some Branches are managed differently, they all represent Australian & Allied Malaya/Malaysian military veterans. 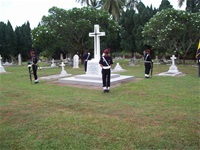 Annual services held in Malaysia are held at the Kamunting Road Christian Cemetery Taiping, the Ipoh Cenotaph, God's Little Acre at Batu Gajah, and the 2nd Battalion Royal Rangers Camp at Kem Syed Putra. At the Christian Cemetery at Taiping, there are 28 grave sites of Australian soldiers who died during, and beyond the Malayan Emergency. There are also some Australian dependents buried there. This website attracts over 300 visitors per week and is primarily for the benefit of Defence & Police Veterans who served in the SE/Asia Pacific Area from WW2 to the present day. The site is privately owned and operated, and is for those who want to know of Australia's military involvement in SE Asia from the 1940s to the present day. Individuals or like-minded Associations may apply to use the site to advertise meeting dates or future events if they so desire. Telephone (03) 6383 4677 Mob:0427 314304....OR, use the devices available on the site itself. 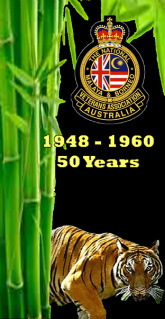 Membership of NMBVAATASINC is open to all who served in Her Majesty's Forces, the Commonwealth Forces, the Royal Federation of Malaya Police, the Civil Service, Saint John Ambulance and Auxiliary Forces during the Second World War, The Korean War, The Malayan Emergency, the Indonesian Confrontation and all other conflicts in the area thereafter. Please refer to the Application Page. Families of members who served in the above Forces are particularly encouraged to use the site to obtain information regarding military involvement in the SE Asian area . Our Association accepts all members who served in and around Malaya/Malaysia. Please send me unit histories so they may be put onto this website. I served at Butterworth 1983-85. I am trying to trace a member of the Federation of Malaya Police, Alex or Alec Young, for a relative. Any help appreciated. I was in Malaya from 1955 to 1957 with the R.A.F in Butterworth can I apply??? You are most welcome; please fill in the application on this website. I am trying to find out where the Club house of the Perth ,WA. is ? Thank you it is very interesting. Being a 5th Battalion Soldier I particularly like the Tiger.